The mission of CIS is to surrounds students with a community of support, empowering them to stay in school and achieve in life. We place dedicated staff members called Site Coordinators in local schools where they build strong relationships with students, parents, educators, and community members. 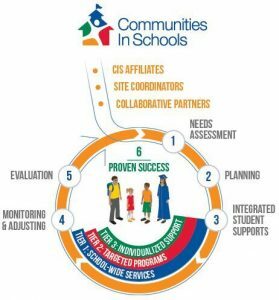 Our site coordinators identify barriers that prevent students from succeeding in school. The administrators and site coordinators will then work together to develop individual plans and build teams of support.